Smart polymers and functional bionanomaterials are integral to many chemical and material engineering processes for the current and future advanced manufacturing. Finely tuned interfacial layer plays important roles in the development of advanced materials and manufacturing processes at small length scales, where the surface forces and adhesion play the dominant roles. Bio-inspiration (i.e. learning from nature) has been a helpful and productive approach to design and develop smart materials systems and engineer materials interface to enable desired properties such as super wettability, switchable adhesion, tunable conductivity, sensing capability. In this talk, I will present our recent developments of smart polymers, bio-inspired interfacial technologies (surface patterning and functionalization), and a suite of functional bionanomaterials, and discuss the technical implications for advanced manufacturing. 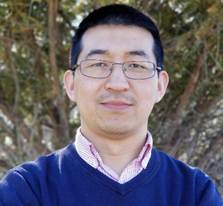 Dr. Boxin Zhao is a tenured associate professor at the University of Waterloo in Canada. Dr. Zhao obtained his PhD in Chemical Engineering from McMaster University in 2004. Before joining the University of Waterloo in 2008, Dr. Zhao had worked as a NSERC postdoctoral fellow in Professor Jacob Israelachvili’s Interfacial Science Laboratory at the University of California, Santa Barbara. At Waterloo, he has created and directed the Laboratory of Surface Science and Bionanomaterials, working on both fundamental and applied research. He has 95 are peer-refereed papers on the top journals including Langmuir, Macromolecules, Advanced Materials, and Advanced Functional Materials, PNAS. The current research interests of his group are in the areas of smart polymers and multifunctional composites, interfacial technologies and surface science, biomimetic adhesion and adhesives, 3D printing, interfacial phenomena and contact dy namics in polymers and biological systems.